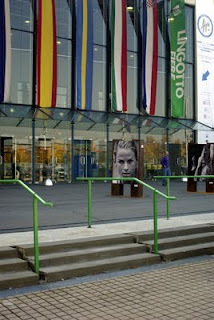 I just returned from a weekend in Torino attending the Wine Forum fair. This show focused on the lesser-known wines of Piemonte, so while it was possible to taste examples of Barolo and Barbaresco, wines such as Erbaluce, Gavi, Carena and Barbera were the featured attractions. 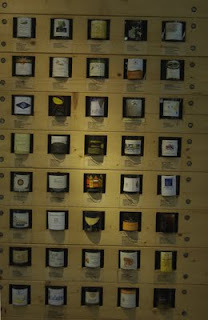 I’d like to mention just a few of the wines I thought were most special. Most Americans aren’t familiar with the Erbaluce grape, but when grown in the Caluso area about twenty miles northeast of Torino, it shines. The grape has naturally high acidity along with lovely aromatics, so it is produced not only as a richly flavored dry white wine, but also in a sparkling version. A few estates also make a passito version, which is lush and moderately sweet; some versions have a lovely crème caramel character to them. The best producers of Erbaluce di Caluso include Orsolani, La Campore and Cieck. I also tasted some notable versions of Gavi, which is probably Piemonte’s most famous white. Produced from the Cortese grape from vineyards in the region’s southern province of Alessandria, Gavi is also made in several styles. These include the typical stainless steel-aged version as well as oak aged and there are even a few producers that make a sparkling Gavi. I attended an excellent seminar on Saturday that profiled the different approaches vintners take with this wine; especially noteworthy were the late-harvested bottling (finished dry) from La Toledana, the barrique-aged “Monterotondo” bottling from Villa Sparina and the dry sparkling offering from La Giustiniana. Other whites that impressed me this past weekend were the 2008 Favorita from Pietro Olivero (Antica Cascina di Conti Roero), the 2008 Arneis from Casetta and the 2008 Cortese dell’Alto Monferrato and the “Riva Granda” (barrique-aged Chardonnay) from Cerrutti. I also want to mention the notable examples of Timorasso from Franco Martinetti. This indigenous variety is grown in the Colli Tortonesi area northeast of the Gavi zone, almost on the border with the Lombardia region. I sampled two versions of Timorasso from Martinetti: the 2007 Biancofranco, a stainless-steel aged along with the 2008 “Martin” bottling aged in barriques. The former is quite rich with juicy acidity and delicious pineapple fruit, while the latter is excellent, displaying vanilla custard aromas to go with its tropical fruit; the wine has admirable length and complexity and is a standout Piemontese white. I tasted a few examples of Asti Spumante, thanks to my friend Rita Barbero of the Asti Consorzio; two of my favorites were the Cocchi and the “La Selvatica” bottling from Romano Dogliotti. As for Moscato d’Asti, the irresistible lightly sparkling wine with the gorgeous peach and apricot flavors that is as light as a feather on your palate, my preferences included the "La Caudrina" from Romano Dogliotti, the “Oroluce” from Paolo Pizzarin (both from 2008) and the 2009 bottling from Massimo Rivetti – a beautiful bottling that is one of the most delicious I taste ever year! I’ll comment on some of the best red wines I tasted at this event in my next post. This week I conducted a seminar on the wines of Sicily for the VinItalyUSA tour in Chicago. I’ve had the pleasure of conducting a seminar for the past five years for this event and several times it’s been about Sicily. This is a region that has exploded in terms of quality over the past few decades. 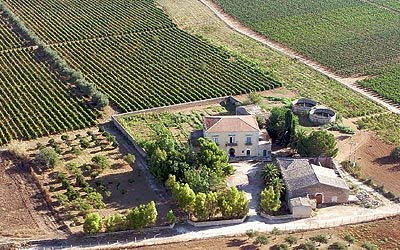 Long known as a producer of bulk wines as well as being the largest wine-producing region in the country – these two factors are tied in – the image of Sicilian wines has changed to one of a greater number of small and mid-size estates being established in growing zones around the island. Particularly important is the emphasis of vintners working with red grapes on the eastern part of the island – in fact, more than 90% of the red grapes in Sicily are planted in the four eastern provinces of Catania, Messina, Siracusa and Ragusa. Arguably the most important plantings are of Nero d’Avola in the Cerasuolo di Vittoria zone and in the far southeastern reaches of the island, near the towns of Avola (where the grape’s name originates), Gela and Noto. We sampled eight wines during the seminar as well as dozens more in the walk around tasting held later in the day. I’d like to focus on a few of my favorites. Avide, a producer in the Cerasuolo di Vittoria district in the province of Ragusa, offered a well made bottling of Frappato under its Herea label. Frappato is one of the two varieties used in Cerasuolo di Vittoria and is not seen as a monovarietal that often. This 2008 bottling has tasty red cherry fruit, soft tannins and tart acidity. It’s a charming red meant for consumption over the next 2-3 years and would pair beautifully with chicken with a red wine sauce or arancini (rice balls); this would even be enjoyable with a slight chill. Their 2007 Cerasuolo di Vittoria DOCG is a 50/50 blend of the two grapes necessary for this wine, Nero d’Avola and Frappato. When this was a DOC wine, the blend from virtually every producer was 60% Nero d’Avola and 40% Frappato, but when the wine was elevated to its DOCG status beginning with the 2005 vintage, more blending freedom was allowed. Today many producers who create a DOCG bottling (producers are allowed to produce a DOC, a DOCG or both) often go with a greater percentage of Nero d’Avola (as much as 70%) to give the wine a little more power, but I actually prefer this bottling, as it is more to the subdued, softer, less tannic style I prefer. This has aromas of fresh red cherry and red roses with an intriguing hint of china bark and there is plenty of perfectly ripe fruit along with an long, elegant finish. This is as well-crafted a Cerasuolo as I’ve had for some time. It’s absolutely delicious and I’d love to pair it with any number of dishes from couscous with vegetables, to swordfish to pasta with tuna. From the island of Pantelleria, south of Sicily, Abraxas is a typical small estate that makes the world famous dessert wine Passito di Pantelleria. More on the later, as I want to focus on two reds this producer also bottles. The 2007 Kuddia di Moro is a 100% Nero d’Avola that has the signature marascino cherry flavors of this grape and is quite rich, yet there is a restrained quality about the wine. A few too many bottlings of Nero d’Avola focus merely on ripeness, so it is nice to see this subtle style with a distinct earthiness in the finish. The second red, Kuddia di Ze from the 2006 vintage, was like finding a treasure map. A blend of Syrah, Grenache and Carignane, this is an old-fashioned Sicilian red with a wonderful rustic quality, very good acidity and a beautiful spiciness. I generally prefer traditional reds over the modern reds that show off oak and ripness, so this was a real treat for me and I heard so many positive comments on this wine from those who sampled it at the seminar or later at the tasting. This is a wine that screams out for food – pair it with dishes such as eggplant parmigiana, grilled sausage or pasta with fennel. How nice that a producer from Pantelleria has chosen to produce a red as wonderful and as singular as this. We need more producers who are willing to make wines that tells the story of their land instead of bottlings that are market driven. As for the 2006 Passito di Pantelleria from Abraxas, well, the word outstanding may not do justice to this bottling! Displaying a light orange color and gorgeous aromas of dried apricot, orange peel and subtle notes of dried honey and graham crackers (! ), this has terrific depth of fruit and an ultralong, lightly sweet finish with cleansing acidity and notes of orange peel. This is a classic and as rich as it is, it is quite restrained and beautifully balanced. What great complexity – this has everything you would look for in a dessert wine! The Mille e una Notte from Donnafugata has become one of the most prestigious bottlings of Nero d’Avola from Sicily. Sporting a deep ruby red color with hints of purple, this is quite rich with sumptuous black cherry and blackberry fruit backed by very good acidity and elegant tannins. This has been one of the most consistent bottlings of this variety in Sicily and the 2005 continues that track record. The firm’s pleasant 2008 Anthilia, a dry white blended from Ansonica and Cataratto, has fresh pear fruit, good richness, a dry, tasty finish and is quite a fine value for around $16. A few other Sicilian wines that caught my attention included three lovely bottlings of Grillo from the 2008 vintage; the Tonnino with a lovely copper color and aromas of pear and canteloupe, the Aquilae with pretty aromas of pear and creamed corn along with the Fina, which displayed interesting aromatics feauturing kiwi and lemon. These medium-bodied whites also had good texture (especially the Aquilae and Fina) and are evidence that Grillo is becoming one of Sicily’s best aromatic whites. There’s never an end to discovering new Italian wines and producers and the vintners of Sicily are certainly doing their part to make this journey a fascinating and enjoyable one! One last note: I would like to thank Marina Nedic and Ina Majcen of I.E.M., the management company that organizes this event as well as Paul Wagner of Balzac Communications of Napa for their help and for showing their faith in me for all these years. I couldn’t lead one of these seminars without their help, so thank you Marina, Ina and Paul and I look forward to doing this again next year! I enjoyed lunch with my friend Laura Bianchi at the Trump Tower in Chicago a few weeks ago. I’ve known Laura for several years now, first meeting her during a visit to Castello di Monsanto, the gorgeous Chianti Classico estate owned by her father Fabrizio and her. Laura travels the world, overseeing sales of the wines; this lunch was my chance to catch up on the latest wines as well as trends in Chianti Classico. She told me that business is down (thanks to the realities of the economy) in just about every region where they sell their wines, but she didn’t seem overly concerned, especially as they are a small producer that doesn’t need to sell hundreds of thousands of cases. 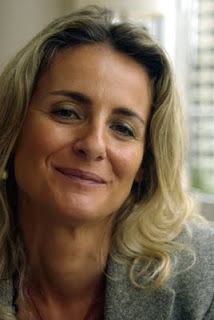 She's confident that sales will improve soon and return to normal levels. I’d say she probably wasn’t all the concerned, given the quality of the wines, which are as good as ever. Laura, being the humble spokesperson, wouldn’t comment on the excellence of her family’s products, but she certainly realizes it. I tasted three wines at lunch and each was a delight. The 2006 Chianti Classico Riserva was first and talk about a stylish wine! There are aromas of red cherry, plum and currant with notes of cedar; the finish is elegant with moderate tannins, very good acidity and subtle spice. This is so good now and will offer pleasure for another 5-7 years. The 2003 Il Poggio was next; this being the single vineyard wine that made Monsano such a famous producer in Chianti. This has greater richness on the palate than the Chianti Classico normale, yet is beautifully balanced with a big finish with excellent persistence. This is a beauty and will last for another 10-12 years. Depending on the market you live in, this may be the current offering or perhaps the 2004 has come on the scene. That wine is superb with the difference clearly being the wonderful growing season of 2004, but each wine is very classy. The final wine that day was the 2001 Nemo, a 100% Cabernet Sauvignon from an estate vineyard some 850 feet above sea level. This is a bit more modern-styled bottling with aging in small French oak barrels, yet the oak is nicely integrated in this bottling. There are lovely aromas of black currant and myrtle and the tannins are quite graceful. Look for this wine, from an oustanding vintage, to be at its best in another 10-12 years. Three different wines in three various frameworks, but all quite elegantly styled, like all of the wines of Castello di Monsanto. I never tire of beautifully made wines and as that’s all that Monsanto seems capable of producing, I don’t think I’ll ever get blasé about tasting their wines – especially when I can do that over a lunch with Laura Bianchi! 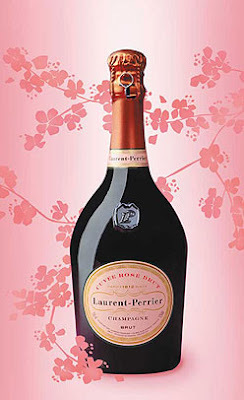 These wines are imported by Moët Hennessy of New York. Prices vary depending on what market you live in, but expect to pay about $25 for the Riserva, $50 for the Il Poggio and $55 for the Nemo. How many foods can you think of to pair with a Rosé Champagne? The answer depends on your imagination and if the wine is to be served at one of the country’s greatest restaurants, there might be no end to dishes that work with this wine. Last week, I was invited by the Champagne firm of Laurent Perrier to meet their president, Bertrand de Fleurian, for dinner at Charlie Trotter’s Restaurant in Chicago. 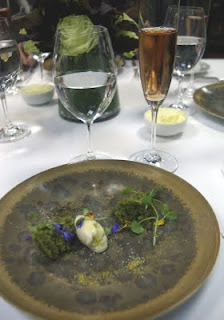 The purpose was not only for us to learn more about each other, but also to enjoy a dinner in which each course was specially created to accompany the firm’s Cuvée Rosé Brut. Aurélie Baetche, local manager for Laurent Perrier, was co-host and she also invited a local journalist from the Chicago Sun-Times. Now I love Rosé Champagne and if they had hosted this at a hot dog stand, I would have attended! 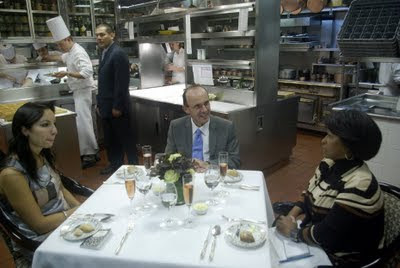 But of course, they went first-class and celebrated this event at Charlie Trotter’s. Meeting de Fleurian at Charlie Trotter’s for dinner is my kind of great evening, but what made this even more special was the fact that they reserved the kitchen table for us. There is one table of four in this kitchen and it’s quite an experience to see up close how a great restaurant staff works as a team. No orderly chaos here; this is a group whose work has been carefully choreographed and comes off as gracefully as a ballet troupe. We began dinner at 6:00 and three hours and fifteen courses later (yes, 15! ), dinner was complete. First things first, the Rosé is excellent with delicious strawberry and currant fruit, lively acidity, lovely complexity and beautiful freshness and balance. When you have a 100% Pinot Noir Champagne made this well with this depth of fruit, it’s only natural that you can pair so many types of food with the wine. But while most of us could think of four to five dishes to accompany a Rosé Champagne, great chefs come up with so many more inspired ideas. 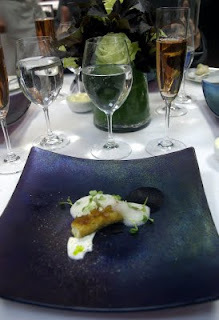 Executve chef Matthias Merges presented a dazzling array of foods, from the opening course of Kumomoto Oyster with Miso and Lime to the final touch of Olive Oil-Chocolate Chip Parfait with Fraise des Bois. Now there’s something you don’t have every night! A few of my favorites along the way included Confit of Tasmanian Trout with Rose & Black Tea, Lemon Verbena Spoon Bread with Honey & Chervil as well as Ricotta with Vidalia Onion Marmalade and Arugula. If I had to pick one course that I thought was a perfect match with the Champagne, it would be the Japanese Fresh Water Eel with Orange and Grains of Paradise. I’m not normally too big on eel, but this was quite meaty, without the oiliness I so often associate with eel. This was my favorite, but let it be said, that there were another nine or ten courses that worked equally well. Best of all, each of the 15 courses was so beautifully prepared with such specific flavors, yet all were so light on the palate. I don't think I’ll ever have a meal like this again, so thanks to Aurélie and Bertrand for the invitation as well as their company and thanks to Chef Merges and his brilliant team at Charlie Trotter’s for their incredibly inspired work. The moral of the story is simple; Rosé Champagne – especially the Laurent Perrier Cuvée Rosé Brut – is a perfect match for almost any food. I doubt many of you will have Tempura of Sardine with Peach Consommé & Spanish Chorizo or Cold-Poached Cod Cheeks with Heirloom Tomato Relish with the wine when you open your bottle, but try it with duck breast, tuna or even with a simple roasted chicken breast – you’ll love it! I just received word from the national importer of Casanova di Neri, the famed Brunello producer, that the winery has been cleared of any wrongdoing in the ongoing Brunello scandal. Owner Giacomo Neri, whose deeply extracted, modern take on Brunello has won him a legion of fans, had been suspected of incorporating grapes other than Sangiovese into his various bottlings of Brunello di Montalcino. Giacomo Neri obtained a document directly from the Minister of Justice, issued 9/21/09. This document says "NULLA." Casanova di Neri in response to news that has circulated through the media, states that as one of the more important wineries in the zone, they were checked and controlled by the required authorities. 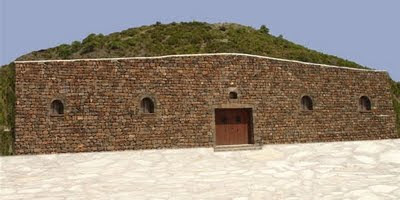 The winery states that Casanova di Neri has been removed in the course of the investigations from the list. For what has happened we inform our clients that the wines of Casanova di Neri are even more guaranteed post-investigation than before, having completed also the analysis that were requested by the authorities for the commercialization of Brunello di Montalcino. I'd love to hear some thoughts on this. Anyone?